OSWEGO, NY – The Minetto Cub Scout Pack 819 went to Mark’s Pizzeria in Oswego to see the inside of the facility and learn how to make pizzas, chicken wings and pizza dough. The scouts were able to make their own personal pizza. 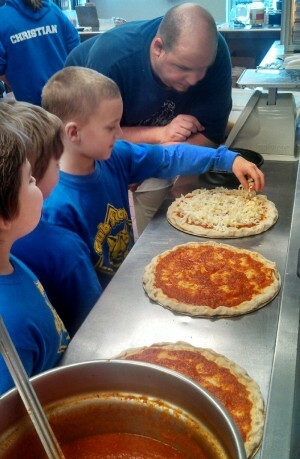 In the picture is Paul the owner of Mark’s Pizzeria, Paul Berlin is putting cheese on his pizza while Kaeden and Logan Inch watch.